The short answer to the question in the subject line is ‘no’. 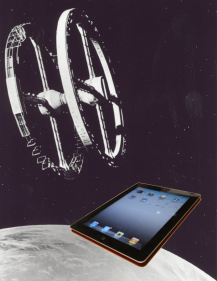 Neither the director Stanley Kubrick, nor writer Arthur C. Clarke, can be credited with having invented the iPad2 in their depiction of tablet-style devices in the film 2001: A Space Odyssey. However, they may have designed its external appearance, and this may be enough to prevent Apple from enforcing its alleged intellectual property rights in relation to the physical appearance of its latest tablet. As is being widely reported today (e.g. in the Fairfax press here in Australia, and on the FOSS Patents blog), Samsung has offered a still image, and a YouTube clip, from Kubrick’s film in its defence of a US ‘patent’ lawsuit brought against it by Apple. There has been some confusion, however, due to the fact that in the US there are three kinds of ‘patents’. The familiar ‘utility patent’ protects functional inventions, while the ‘design patent’ protects physical appearance. The third type of patent is a ‘plant patent’ which protects new plant breeds. Here in Australia, as in many other countries, we avoid this confusion by calling our equivalent to the ‘design patent’ simply a ‘registered design’. Since registered designs (or design patents) protect appearance, you cannot have a valid and enforceable registration for something which looks the same as, or too similar to, a previously-existing article. There is no reason why such a prior article should need to be functional. For example, you would not be entitled to protect a design for a working car that had simply been copied from an earlier clay model, or non-functional ‘concept’, that had been created by someone else. Indeed, by doing so you would most likely be infringing their copyright. This is the situation in the Samsung defence. If Apple cannot actually claim credit as the original designer of the slimline form of its iPad2 tablet, it cannot maintain a valid design patent registration. If the court finds that the Space Odyssey tablets are sufficiently simialr in appearance to Apple’s design, it will be of no avail for Apple to object that the movie tablets are fictional. The props were most likely real – though, presumably, non-functional. In Australia, the iPad2 design is the subject of Australian Design Registration no. 337931, an image from which is shown below. The Australian design registration has not yet been examined and certified as enforceable, so Apple cannot currently deploy it against Samsung in this country. If Apple does request examination of the design, we are confident that Samsung will send the examiner a free DVD copy of 2001: A Space Odyssey! A very interesting article, I think it will make Samsung have the edge. Hopefully. I think that it will prove very difficult to protect the shape of a slimline tablet. The objective seems to be to eliminate any 'distinctive' features, leaving something that is as slim and sleek as technically possible. Of course such things have been imagined, and represented, before. The difference is that the technology to pack all of the required functionality into such a slim package is now available. Unfortunately for Samsung, Apple's greater strength lies in its (utility) patents, and these cannot be defeated by science fiction alone! Science fiction describing functionality or operational principles can become prior art for a (utility patent). Yes, if the 'fictional' disclosure is sufficiently detailed to enable someone to make the article described. It has been reported that science fiction writer Robert A. Heinlein described a waterbed in sufficient detail to act as effective prior art against a subsequent patent application. However, advanced technology rarely falls into this category. Books, films and television series have often described and depicted fictional technologies years ahead of the time when it became possible to actually put them into practice. Generally these do not prevent a patent subsequently being granted to someone who is able to develop, describe and claim a practical working implementation of the 'science fiction' technology. By way of example, if someone were to develop a working teleportation transporter tomorrow, they would not be barred from obtaining a patent merely because a fictional version had previously been depicted in Star Trek. This is a very good post! I admire the way you shared this topic! Keep it up a good job! credit report and score.